The Visual Workplace training course discusses how to use visual communication to create a clear, safe, and sustainable environment for workers, including topics like visual facility guidelines, visual machine maintenance systems, and visual observation systems. Visual communication is a method of communication designed to share information by quickly viewing it. This is accomplished by creating signs, display boards, and screens that organize the information into simple-to-read formats such as charts, color coding, and symbols. This Lean Manufacturing training course covers visual communication, the elements of a visual workplace, visual documentation, visual control, visual production indicators, and creating and sustaining the visual workplace. 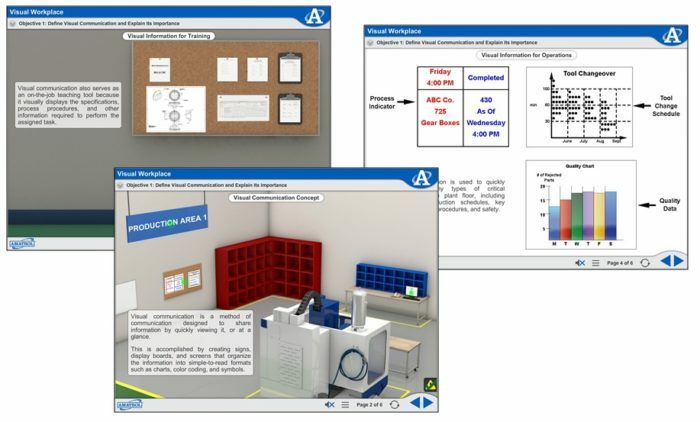 Learners will study selecting workplace borders, assigning workplace items and location addresses, and elements of visual workplace territory, visual safety system, visual machine maintenance system, and visual office system. This course also discusses types of and guidelines for visual documentation, the elements of visual production control systems, visual schedule displays, and visual quality systems, and more!